Make that wedding day extra special for the happy couple. Celebrate the wonderful occasion with a personalised string of embroidered bunting . 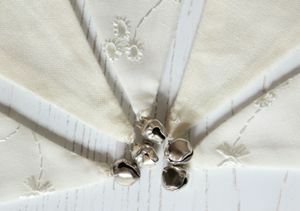 The photos show a very small selection of bunting made for our wonderful brides & grooms. We work with you on fabric colours and will take you through each step of the way. Nine pennant wedding strings with three embroidered pennants start from £30. 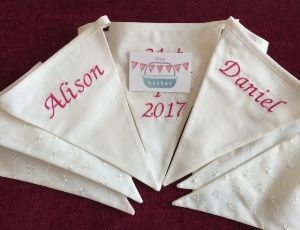 This fab string of personalised bunting is not just for the Wedding Day but can be used for Anniversaries too. We are sure the string will hold lots of wonderful memories of that special day, so it is a gift that will last a very long time to. 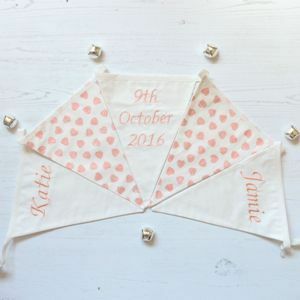 We will guide you through your fabric selection, embroidery thread colour and your bunting will include three embroidered pennants with the Bride and Grooms names and the marriage date. 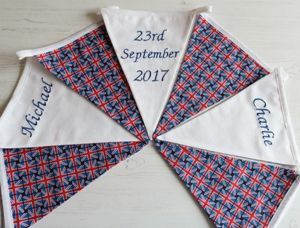 Once all the selections have been made and payment has been received you would need to allow at least 10 working days (2 weeks) before your bunting would be posted. At busy times this might be longer but we would let you know this in advance. CLICK HERE You will be asked to fill in your name and email address, in the message box please fill in your requirement's. We will then get back to you with fabrics and colours and cost. 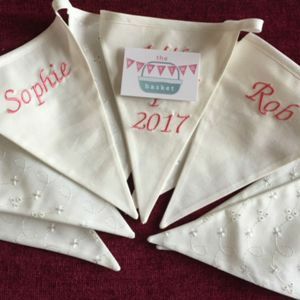 Please Note - Prices vary depending on what you would like and also note that all bunting strings that are made to the customer's specification and clearly personalised will not be refunded.